There are six unique segments of the American public that each engage with the issue of global warming in their own distinct way. Just over half of American adults (51 percent) are either Alarmed or Concerned about global warming, and these individuals are poised to vote on the issue with their pocket books and at the ballot box. 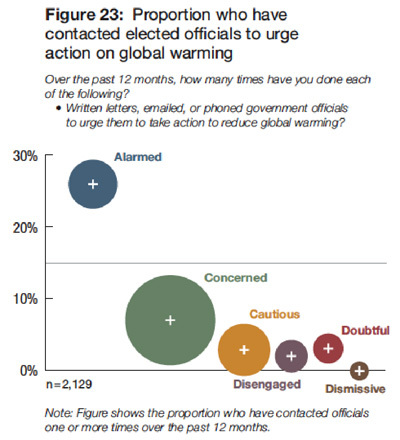 The Alarmed (18 percent of the U.S. adult population) are the segment most engaged in the issue of global warming. They are very convinced it is happening, human-caused, and a serious and urgent threat. The Alarmed are already making changes in their own lives and support an aggressive national response (see graphs below). The Concerned (33 percent) are also convinced that global warming is a serious problem and support a vigorous national response. Members of this group have signaled their intention to at least engage in consumer action on global warming in the near term, but they are less personally involved in the issue and have taken fewer actions than the Alarmed. The Cautious (19 percent) also believe that global warming is a problem, although they are less certain that it is happening than the Alarmed or the Concerned. They do not view it as a personal threat, and do not feel a sense of urgency to deal with it. The Disengaged (12 percent) do not know and have not thought much about the issue at all and say that they could easily change their minds about global warming. 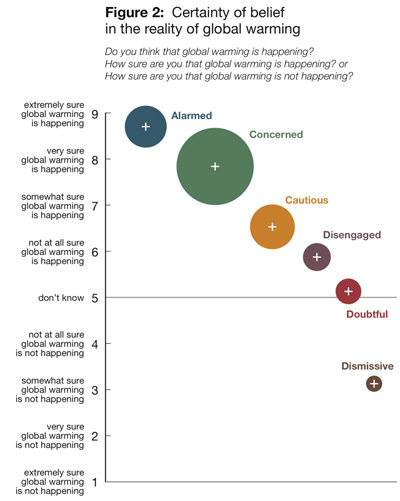 The Doubtful (11 percent) are evenly split among those who think global warming is happening, those who think it isn’t, and those who do not know. Many within this group believe that if global warming is happening, it is caused by natural changes in the environment. They believe that it won’t harm people for many decades, if at all, and they say that America is already doing enough to respond to the threat. The Dismissive (7 percent), like the Alarmed, are actively engaged in the issue, but are on the opposite end of the spectrum. Most members of this group believe that global warming is not happening, is not a threat to either people or non-human nature, and strongly believe that it does not warrant a national response. Very large proportions of the Alarmed and the Concerned are currently or intend to begin rewarding or punishing companies that are either enacting or opposing steps to reduce global warming. Overall, 58 percent of Americans—134 million adults—intend to reward or punish companies through their product purchases in the near term. The primary barrier to this consumer action, however, is knowledge—68 percent of these consumers say they simply don’t know which companies to reward or punish. More than half (52 percent) of the Alarmed and 17 percent of the Concerned have already or intend to contact elected officials in the next 12 months to urge them to take action on global warming. This represents a large potential “issue public” waiting to be mobilized. These groups express strong support for a wide range of climate and energy policies. This is shown, for example, by their strong support for regulating CO2 as a pollutant. The very large size of the Concerned segment—one out of three American adults—and their increasing willingness to express their concern about climate change through changes in their consumer and political behavior, suggests that the United States could be rapidly approaching an important tipping point in public engagement. 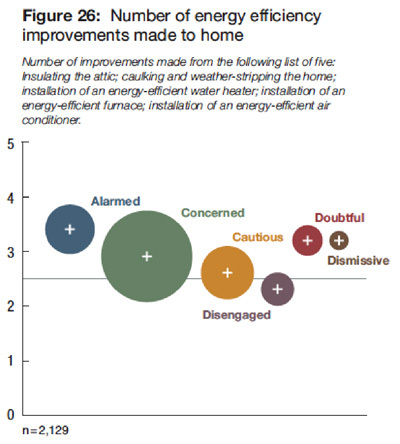 Interest in personal energy conservation is even more common across all six groups, which may be motivated by a desire to save money, in addition to any advantages to the environment. This reflects results drawn from the same data in a previously released report, “Climate Change in the American Mind,” which found that, by over a 5-to-1 margin, Americans believe changing their lifestyle to reduce carbon emissions would actually improve or have no impact on (versus decrease) their quality of life. Policies that help people reduce their energy use through energy efficiency improvements thus receive wide support, regardless of individual opinions about climate change. “Climate Change in the American Mind” also found that despite the economic crisis, more than 90 percent of Americans said the United States should act to reduce global warming, even if it has economic costs (Figure 5). 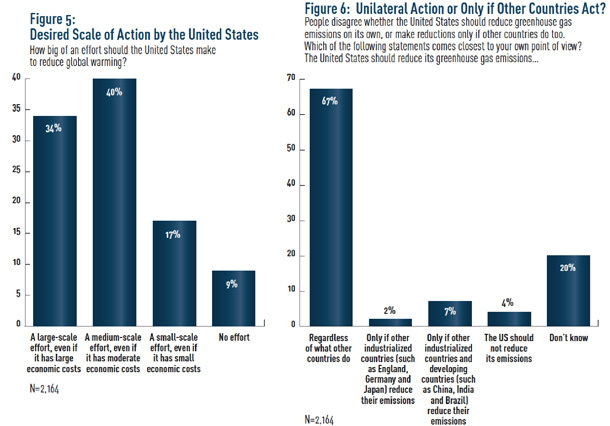 Likewise, 67 percent of Americans said, “The United States should reduce its greenhouse gas emissions regardless of what other countries do” (Figure 6). The data for “Global Warming’s Six Americas” and “Climate Change in the American Mind” was drawn from a nationally representative survey of 2,129 American adults in the fall of 2008. The survey questionnaire included extensive, in-depth measures of public climate change beliefs, attitudes, risk perceptions, policy preferences, behaviors, barriers to action, motivations, and values. The charts below visualize some of the report’s major findings. The size of the circles and width of the columns represent the proportion of the American public in each audience segment. The small cross at the center of each circle represents the segment average response to the question. The ”6 Americas” fall on a scale from extremely sure to unsure that global warming is happening, with the majority somewhat to very sure that it is occurring. 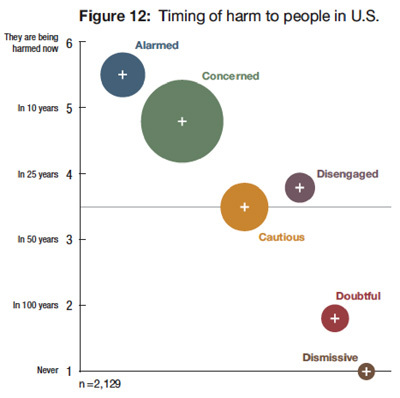 The Alarmed and Concerned generally believe that global warming is currently harming or will harm Americans within the next 10 years or so, while the Cautious and Disengaged believe it will take 25 to 50 years. The Doubtful and Dismissive believe it is very far off or will not occur at all. 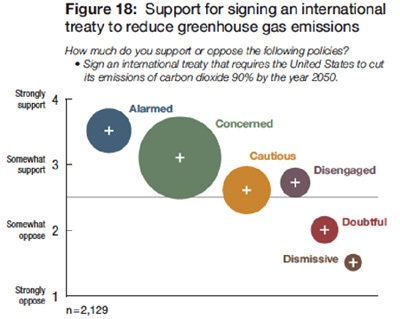 Most Americans support an international treaty to reduce greenhouse gas emissions; only the Doubtful and Dismissive are opposed. 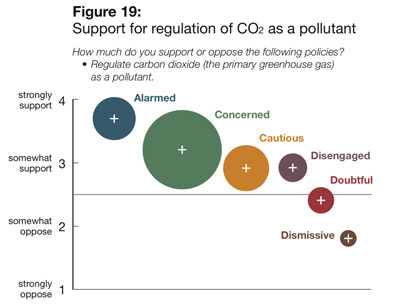 Most Americans strongly or somewhat support regulating CO2 as a pollutant. 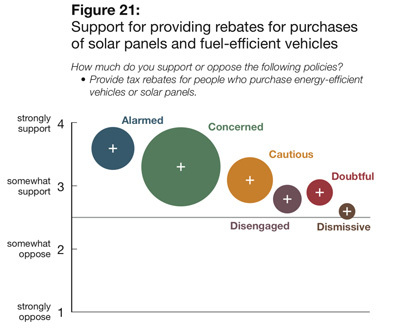 Almost all Americans strongly or somewhat support rebates for the purchase of solar panels and fuel-efficient cars, including the Dismissive. Few Americans have contacted their elected officials about global warming, although many of the Alarmed and Concerned say they intend to within the next year. 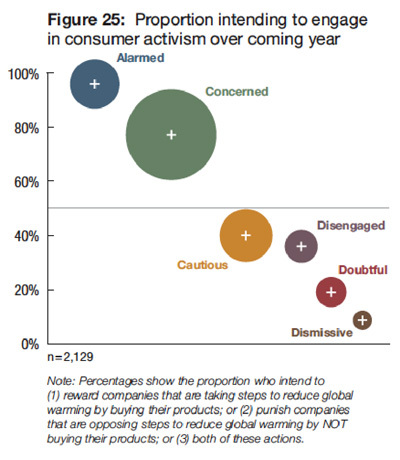 The majority of the Alarmed and Concerned plan to make purchasing decisions based on whether companies are enacting or opposing steps to reduce global warming. Members of all six groups have made some energy efficiency improvements to their homes, which may come from a desire to save money, rather than the environment. Anthony Leiserowitz is Director of Yale Project on Climate Change, Edward Maibach is Director of the Center for Climate Change Communication at George Mason University, and Andrew Light is a Senior Fellow at the Center for American Progress and Director of the Center for Global Ethics at GMU.